This portable barn-style garage sets up quickly using slip fit connectors and swedged tubing, and does not usually require a building permit. The beam welded 2" diameter 17-gauge frame is tested to hold up even in rigorous weather conditions. The frame surface is coated to resist rust, weather, chipping and peeling. 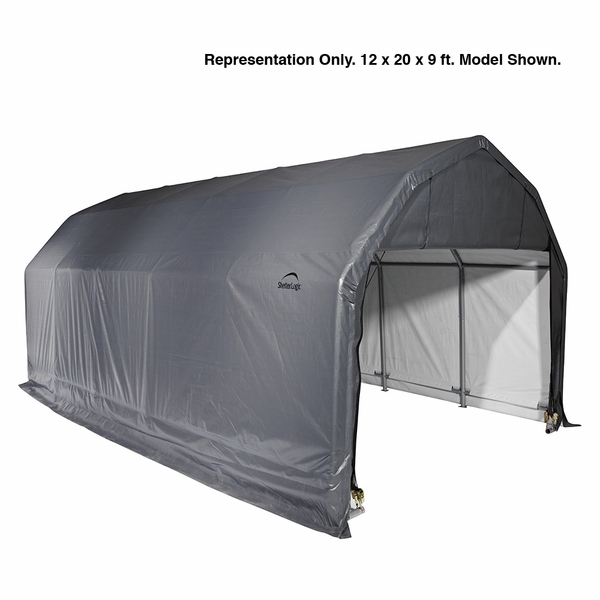 The canopy secures to the frame with patented Twist-Tite tensioning system that secures the fabric tight to the pipes for a wrinkle-free look. 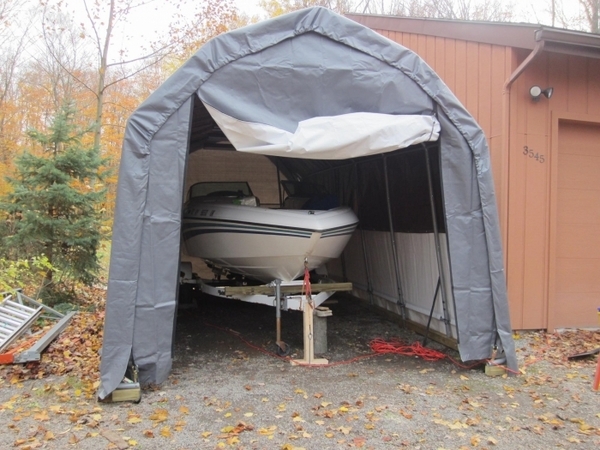 The Easy-Slide Cross Rail system clamps tight to square up and lock down the shelter. The cover is treated inside and out against fading, aging and fungus, and is white inside to enhance natural light. The door is 8' 6'' high to accommodate large vehicles. The 5-box shipment includes the frame, cover, two zippered door panels, six 30" auger anchors, two roll up door kits, one vent kit, steel foot plates, and instructions. 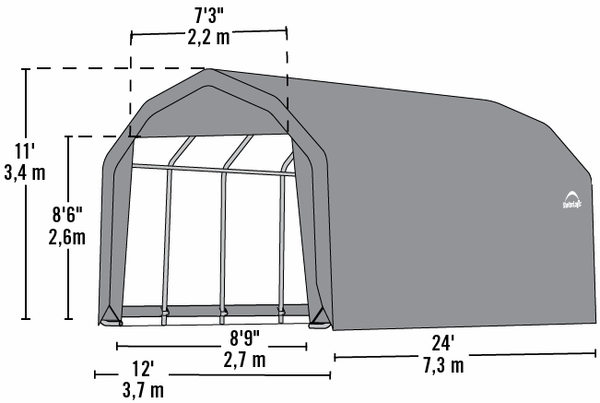 How can I anchor this canopy to cement? Per the manufacturer, you can use 3/8" diameter and 9" long cement lags to anchor this to your pad. These are available at any local hardware store. Quick and easy setup. Hung some fluorescent lights so I can work on my 20 foot Baja this winter and stay out of the weather. I purchased this product used in 2007. It had been up for several years. Set it up and anhored it. It was subjected to winds up to 70 MPH. It tended to hover a bit in the strong winds but the tiedowns kept it from leaving. It finally tore 2 nights ago in 50 MPH winds. Most of the winds were from the ends. Ordered a complete replacement canopy. Looking for another 6-7 years. ProsCustomer service is excellent. Knowledgeable service reps. Durable! Stood up to 18 " of snow When the sun shines it gets nice and toasty inside. ConsThe turnbuckles on the canopy have a tendency to work loose so they have to be checked regularly if there are steady winds. I am going to safety wire the new ones. The items shipped as described and the delivery company was very accommodating. The boxes could be a little more descriptive as far as what parts were included. I.e. End frame and center ribs, legs etc. the directions were not very detailed. I could see how the average weekend tinkerer may struggle with the installation. All in all I am very happy with the product as it took me and a friend (both pretty well versed in construction and assembly) a whole day for the installation. Garage came in 5 boxes ,easy to unload with two people. All parts were included in shipment.Set.up took six hours with three workers in a 10 to 15 mph wind.Not the best of conditions but still went OK. The quality of materials are better than I expected and once up and anchored plenty sturdy. 30 + mph winds the next day. Over all I am very pleased ! The shelter took two men two days to install. The structure is sound and. 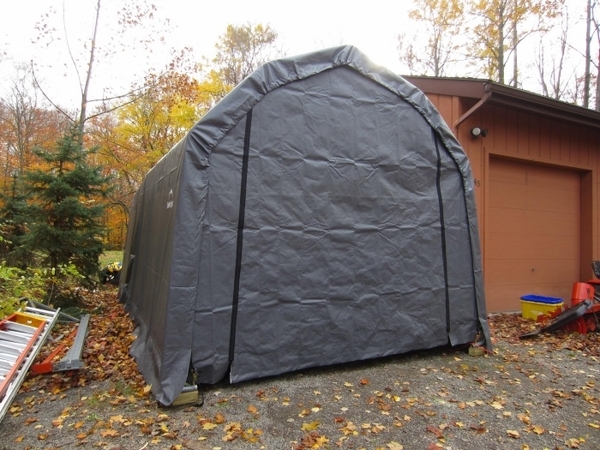 The roll-up double-zippered doors advertised as making opening \"a breeze\" could use another trip to the design engineer. In all, a very satisfactory shelter -for the price. The shelter took two men two days to install. The structure is sound and. The roll-up double-zippered doors advertised as making opening "a breeze" could use another trip to the design engineer. In all, a very satisfactory shelter -for the price.